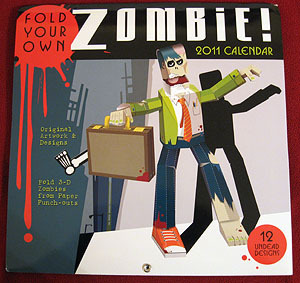 Cool Zombie Calendars for 2011 | We Zombie! each month of the year. 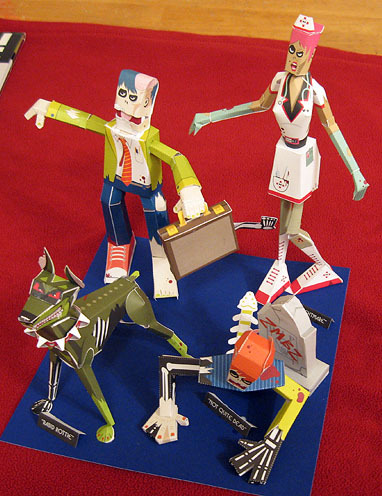 They are fun to put together – each model took me about an hour to assemble including the drying time between stages. I applied Aleene’s Tacky Glue with a toothpick and folded away. All I can say is that you better get them put together before the zombie apocalypse, because once you turn you won’t be able to assemble them – your zombie body just won’t have the skill or coordination to handle the paper or the glue. The figurines are good sized – for example, the nurse is 9 inches tall. This is the coolest zombie calendar I’ve ever seen on the market and should be proudly displayed on the wall by every zombie fan or wannabe. The second calendar is called Zombies, and is illustrated by William Stout, famous for his creation in the 1985 cult classic Return of the Living Dead. That zombie is here, along with many other zombies like the Mona Lisa zombie and the hellbillies zombies. 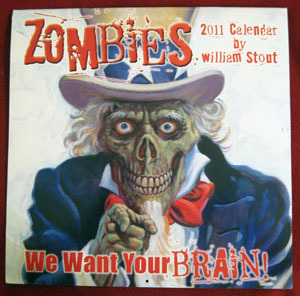 Each month comes with various facts about zombies and the artwork is incredibly detailed and colorful. This is another calendar that you should want to hang on your wall to remind you of what to look forward to when the zombie apocalypse arrives. Another must have calendar! The third calendar is a day-by-day desk calendar, the Zombie Survival Guide from Max Brooks. If you’ve read the book or not, you’ll appreciate the daily advice espoused on the pages of the calendar, and on the back of each page is a diary form to record your observances as you make your way through the apocalypse. The pad will fit perfectly in you survival backpack and will provide you with plenty of paper to record your survival story – and you will survive as long as you have been paying attention to the advice each day. This entry was posted in Books, Products. Bookmark the permalink.